On a mild and unusually almost sunny Wednesday morning, December 12, about 24 folk (wow!) 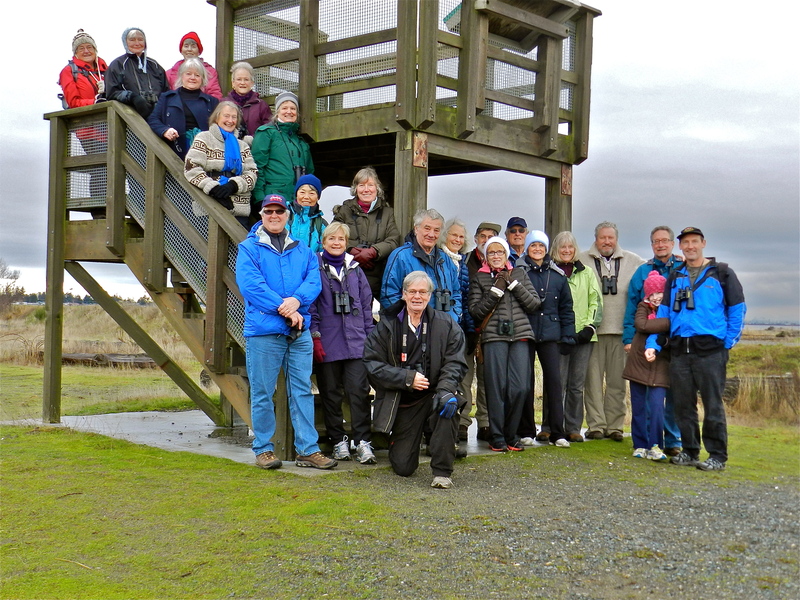 participated in our quarterly DNCB Birds on the Bay outing in Boundary Bay Regional Park. Hi-lites were: good looks at several duck and shorebird species, a posing Cooper’s Hawk, interesting ornithological explanations of Finches and Brant, birding with an eclectic group of weirdos, and the ultimate hi-lite was the feast provided by the Delta Nats Ladies following the walk. 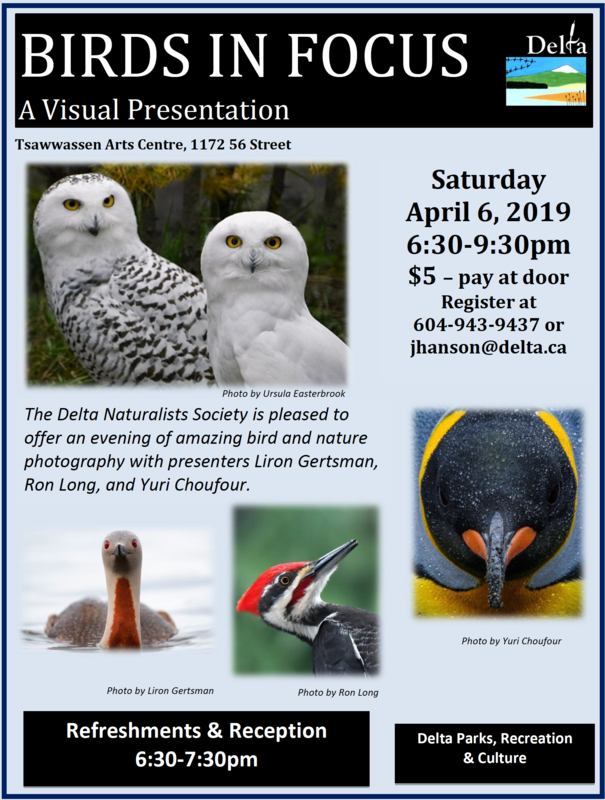 You can see Terry’s, Ken’s and Marion’s photos of these sightings and the participants on our DNCB Picasa site at http://picasaweb.google.com/dncbirding. We all (including regular DNS members, visitors from England, Richmond, Surrey, Vancouver, home-schooled Quinn and her Dad Paul, and first-time Delta residents) gathered at historic Cammidge House at 9:00 a.m. and, following my brief introduction, we wandered along the roadway to the pond by the now gone former concession stand at Centennial Beach. Lots of American Wigeon in the pond and we found one Eurasian Wigeon. We crossed the sandy beach to the shore. Tide was high and there were many rafts of birds, but still quite far out. Thankfully, Paul F, Ken B and Ansa allowed us to use there scopes and most of us had good looks at Red-breasted Mergansers, Surf and White-winged Scoters, a few Horned Grebes, Common Loons, Northern Pintails and more Wigeons and Mallards. Then Quinn spotted four Sanderlings (Anne M’s namesake) on the shore at our feet for good up-close-and-personal looks. use Finches. A number of participants even showed interest (editor’s note: one is a number). We also saw Spotted Towhees, Golden- and White-crowned and Song Sparrows, but were blanked on Western Meadowlarks. Our lively Delta Optimist photographer Gord Goble left us before we reached the Lookout where Ken B took the obligatory Group Photo. 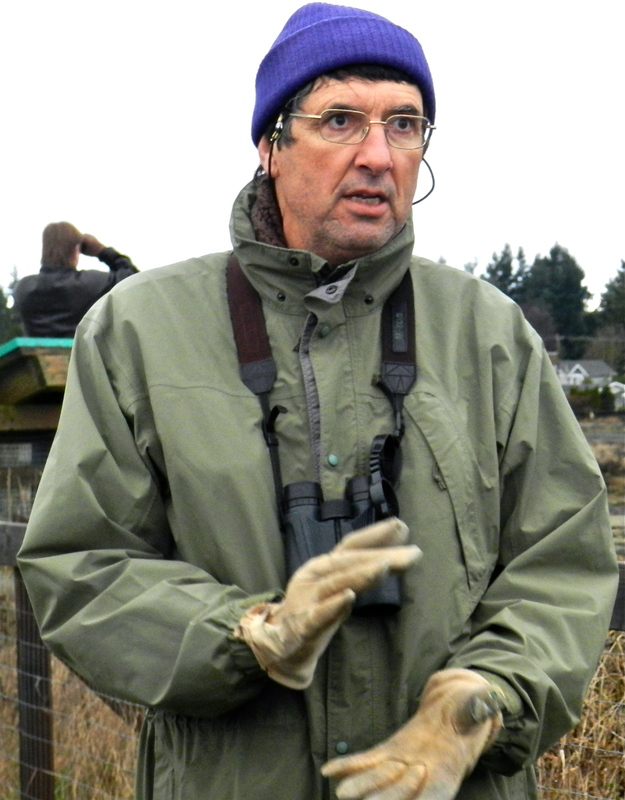 A Northern Harrier glided by behind Ken, creating smiles for the shot. A Cooper’s Hawk perched in a tree with its tail feathers spread for easy identification was a neat sighting for rookies and vets. Continuing along the dike path, we saw lots of Green-winged Teal in the “spit-pond” with a few Greater Yellowlegs and more Pintails, Canada Geese and a juvenile Double-crested Cormorant that, according to our esteemed Delta Naturalist Rick Swanston, was banded earlier this Spring as a baby somewhere south in the USA at the Columbia River. Four Gadwalls were in the stream inside the dike before Terry C scared them away. 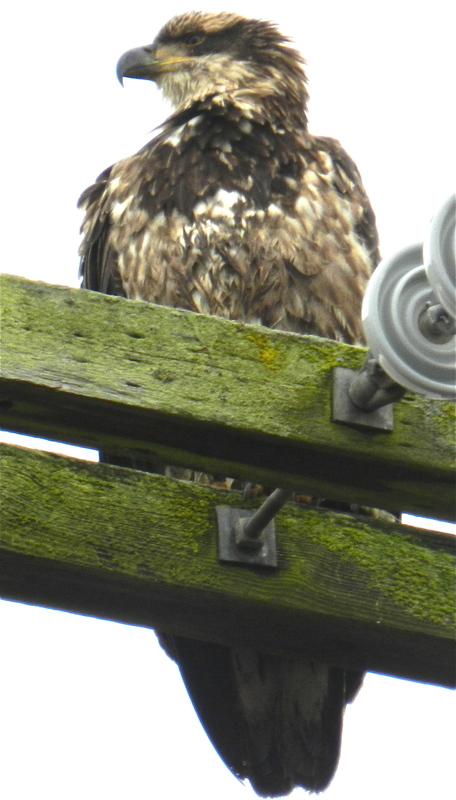 We approached the Pump Station and the juvenile Bald Eagle was standing guard on a pole. About 30 Brant were on the shoreline and Rick gave his dissertation on the Western & Eastern races, banding program, etc. 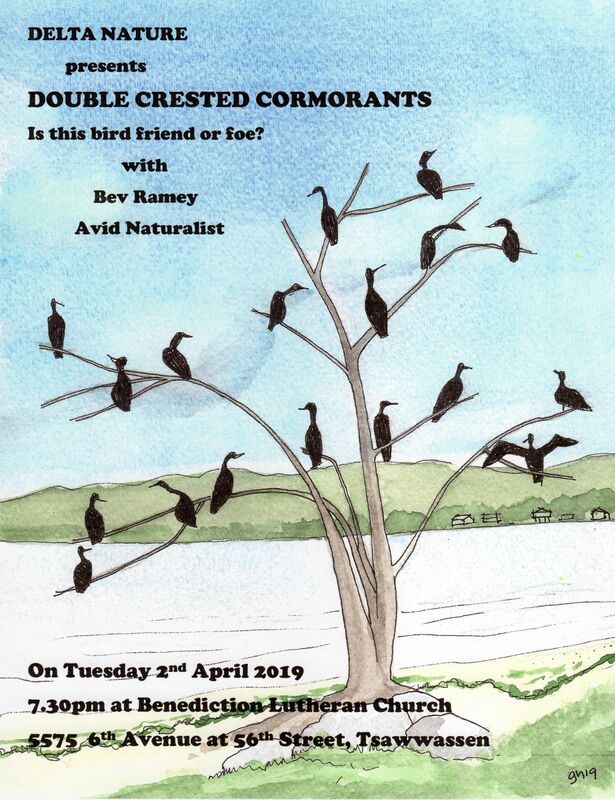 I think he is so familiar with these birds that he has personal names for many of them. Kenny, along with other vets, spotted a flock of Pine Siskins near our DNS Bird Boxes, which turned out to be House Finches. They obviously had not listened to Anne. Meanwhile, a larger mixed flock of Sanderling and Dunlin were foraging along the shore near this 12th Ave. Lookout. Following the inland trail back to Cammidge House, some saw and heard a Marsh Wren. A cute little female Bufflehead was with some Mallards in the slough. Along the trail, other species we saw included: American Goldfinches, Dark-eyed Juncos, Red-winged Blackbirds and European Starlings, several always popular Great Blue Herons, Northern Flicker, one or two of the resident Red-tailed Hawks, including one that looked like a Rough-legged Hawk. No wintering Warblers seen; they must all be on the other side of the Bay at 64th St. with the Snowies. We may have seen other species, but my mind is a bit blurry as I have been very busy since Wednesday with my new Grandfather duties (Juliette Patricia, Dec. 13, 7.05 lbs and gorgeous). 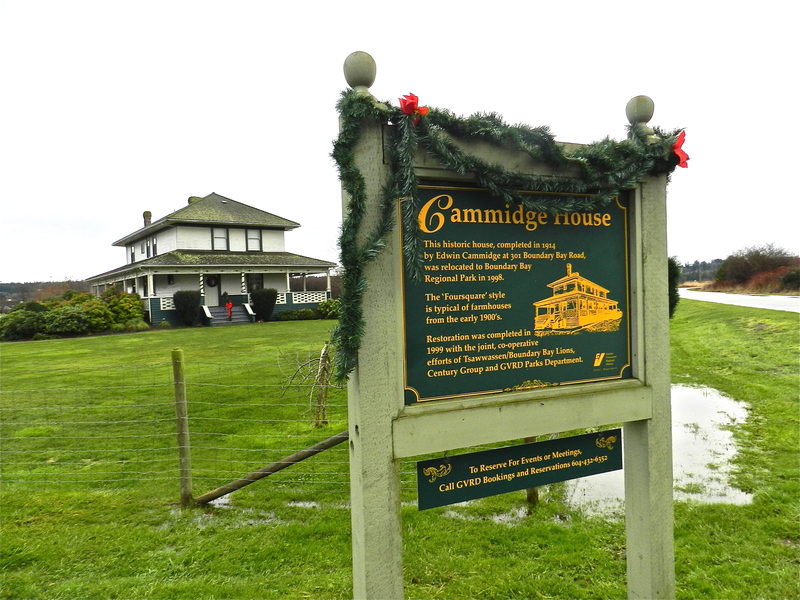 We arrived back at Cammidge House promptly at 11:30 a.m. where the Delta Nats Ladies (Jennifer, Eleanor and Rochelle) met us with drinks and many delectable home-made goodies, sandwiches, pastries, etc. It was an amazing sighting to watch 30 seemingly-starving birders wolf down these treats. It was another awesome DNCB morning. I am switching to Mondays (got Noon hockey on Wednesdays), and will be at Petra’s on Monday, Dec. 17 for departure at 8:00 a.m. on a local outing “somewhere around the Bay” (perhaps the Sage Thrasher at 64th, Reifel, and/or other). Metro Vancouver West Area Regional Parks has initiated the Snowy Owl Watch in response to the return of Snowy Owls to Boundary Bay Regional Park – you might have already seen the posters, signs and Code of Conduct posted along the dyke at strategic locations, and this weekend Interpretation staff will be on the dyke with displays and information materials. a short training session (1.5 hr) for volunteers on the main messages, the public education facts and info (materials provided), and the do’s & don’ts of engaging with the public. 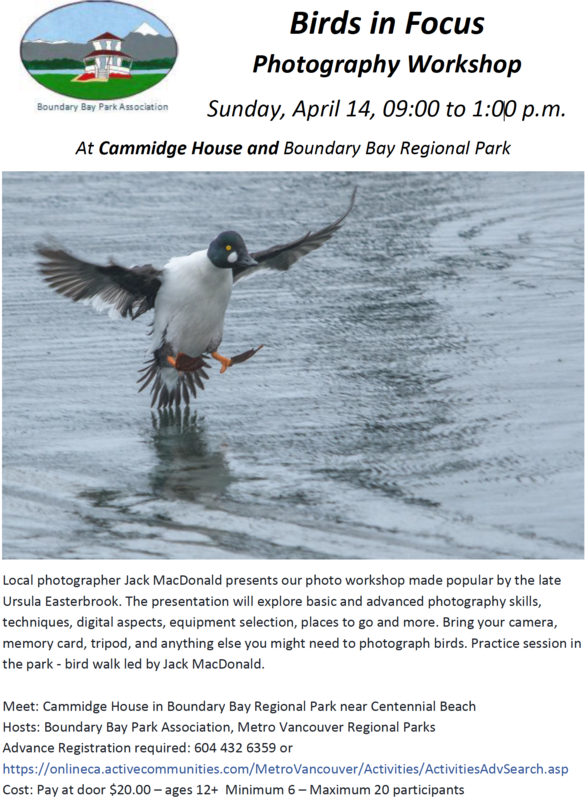 This entry was posted in *DNCB, *DNS, Bald Eagle, BBRP, Birds-on-the-Bay, Cammidge House, Centennial Beach, Cooper's Hawk, Northern Harrier, Red-tailed Hawk. Bookmark the permalink.